"Music is my passion, my profession, my art form, my delight." leads a life full of music and the wonderful people and experiences that it brings. On Sat., Apr. 6, 2019, Marina moderated "Move to the Music," a special workshop exploring musical rhythm through movement, led by Dr. William Bauer, Executive Director of the Dalcroze Society of America. The event was hosted by the Richmond Choral Society, Staten Island. On Jan. 26, 2019, Marina was once again elected President of the NJ Choral Consortium at that organization's Annual Meeting, held in Highland Park, NJ. She also participated as a panelist in a special forum: "Succession Planning, or How to Keep Your Chorus Humming!" ​On Sunday, Nov. 11, 2018 Marina was the Guest Conductor for a choral reading of Carl Orff's 20th c. masterwork, Carmina Burana. Presented by the Princeton Society of Musical Amateurs. With full orchestra. On Sat., Nov. 3, 2018, Marina moderated "Move to the Music!" an exciting workshop exploring singing via rhythm and movement. The clinician was Dr. William Bauer, Executive Director of the Dalcroze Society of America. The event was sponsored by the NJ Choral Consortium. On Sun., Apr. 29, 2019 Marina moderated an exceptional workshop, "Alexander Technique for Singers," led by esteemed clinician and master teacher Valerie VanHoven. ​The event was hosted by the NJ Choral Consortium, which Marina currently serves as President. ​On Sat.,, Apr. 21, 2018, Marina acted as Moderator for a very special workshop sponsored by Richmond Choral Society on Staten Island. "Voice Journey" explored the mind-body connection in singing, challenging singers to open their awareness to sound as vibration and the process of actively hearing. Marina led The Arcadian Chorale is a Special Gala Concert on Oct. 27, 2017, to celebrate the 100th Anniversary of St. Demetrios Greek Orthodox Church in Perth Amboy, NJ. On that occasion, the group sang excerpts from Nicolas Astrinidis' oratorio, St. Demetrius, plus the World Premieres of two new works by Marina. Demetrios, A Worthy Champion is based on the original Byzantine apolytikion (hymn) of St. Demetrios. ​The piece is set in Greek and English, for Tenor and Bass soli, plus SATB Chorus & piano. Great in Spirit, Small in Years is a tribute to St. Nestor, a Christian martyr and key figure in the story and martyrdom of St. Demetrios. It is also based on the original Byzantine apolytikion, set in Greek and English, for Soprano, Tenor, and Bass soli, plus SATB Chorus & piano. Marina's composition, Gabriel from Heaven Came, was performed in Dec. 2018 as part of Arcadian Chorale's holiday program, "The Trumpet Will Sound!" It was also heard on Dec. 16, 2017 by Richmond Choral Society as part of its program, "Holiday in Brass." ​The work had its World Premiere on Sunday, Dec. 6, 2015 as part of the Metropolitan Greek Chorale's fall program, "There Were Angels." The piece is based on the Basque carol, The Angel Gabriel, and is for 4-voice chorus plus piano. For this year's performance, Marina is creating a new orchestration of her piece for brass quintet. Marina also created an orchestration of Felix Mendelssohn's beautiful Te Deum in A Major, WoO 29. ​It was premiered in her concert with the Richmond Choral Society, "Heaven & Nature Sing!" ​on Saturday, Dec. 5, 2015 on Staten Island. Marina's composition, Out of the Depths, received its World Premiere on Sat., June 4, 2016 in Manhattan, as part of the Metropolitan Greek Chorale's Spring program, "Blessed are They Who Sing!" The piece combines the traditional Gregorian chant of Psalm 130, De profundis, with Byzantine chant of Psalm 141, Lord I cried out to Thee, and is in both Latin and Greek. ​by the Amer Consort & Trajecti Voices. In December, in Wellesley, MA by the St. Paul's Adult Choir, ​St. Paul Parish. ﻿Marina's settings of Greek folk songs, Yerakina and Karagouna, were performed summer 2015 by the New Amsterdam Singers during their tour to Greece. Marina's orchestration of Bainton's And I Saw a New Heaven, which premiered at Carnegie Hall in 2002, was performed in mid-December 2015 in North Carolina by the Moore County Choral Society. Hymns from the Rig Veda. Calling for a chamber orchestra of oboe, bassoon, horns, trumpets, trombones, and strings, the pieces were premiered as part of "Music from Across the Pond," her Spring 2015 program with the Richmond Choral Society (NYC), with performances on Staten Island and in Brooklyn. On May 12, 2015 as part of its ​Spring recital, Marina'a college choir, the College of Staten Island Chorus, sang her composition, Her Ways, originally written in 2007, and recently revised. The text is from Proverbs 3:17. In Dec. 2014, several of Marina's compositions were premiered in New York, as part of the Metropolitan Greek Chorale's fall program, "Faith, Myth, & Song: Christmas in Greece." takes a traditional carol telling of churtch bells ringing in the Christmas holiday in a village to a delightful piece for 4-part chorus and piano. For the same program, Marina created a new work based on a Byzantine chant from the Forefeast of the Nativity. 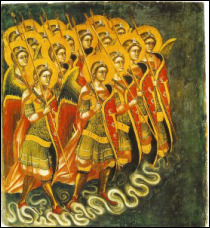 The Army of Angels tells of the appearance of the angelic host to the shepherds,as they herald the news of Christ's birth. ​She has also created concert arrangements of various Greek "kalanda," and a version of Jingle Bells in Greek!